The photo above shows an impressive lightning display that occurred during a severe thunderstorm over the peninsula of Cap Ferrat (Cote d’Azur) in southeastern France on September 2, 2012. To make this shot, I set my compact camera on a wall and took a single 60-second exposure. Though the cloud-to-ground lightning was particularly remarkable, cloud-to-cloud lightning was also prevalent during the course of the storm. 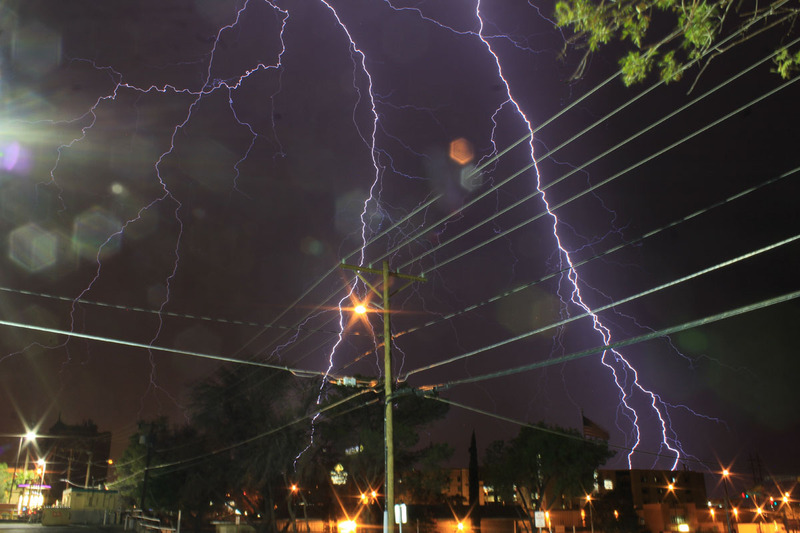 Electrical storms are nearly always negatively charged at their bases and positively charged at their tops. The ground surface beneath developing storms becomes positively charged. Thus, in general, lightning strikes will occur between the cloud base and the oppositely charged ground surface. Lightning can occur between the cloud top (positive) and base (negative) as well as anywhere within the cloud where charges are opposite. Note that the left side of the photo is brighter than the right side due to the presence of the gibbous Moon -- behind clouds at left center. Photo details: Camera Maker: Panasonic; Camera Model: DMC-FX35; Focal Length: 4.4mm (35mm equivalent: 25mm); Aperture: f/2.8; Exposure Time: 60.000 s; ISO equiv: 100; Exposure Bias: none; Metering Mode: Matrix; Exposure: program (Auto); White Balance: Auto; Light Source: Unknown; Flash Fired: No (enforced); Orientation: Normal; Color Space: sRGB; Software: Adobe Photoshop CS4 Windows.